I have a new obsession. Making my own donuts. My growing hips and shrinking clothes aren't too excited about the idea, but my dutch oven (which is now my deep fryer) is thrilled. Today I made a basic "Berliner." These are a lighter, airier version of the "cake" donut, which is what we're mostly used to in donut shops across America. But, we all know that donuts are more about what's inside or on top...or both. Today's beautiful Berliner is no exception. This dish is REALLY all about the sangria poached cherry compote. Today I had three different types of Melissa's dried cherries. I couldn't decide which one to use, so I used them all! Personally, I think this cherry compote should be on EVERYTHING. It would be great on brownies, it would make a great filling for a cake, or even as a "betty" recipe with crumbles and butter! 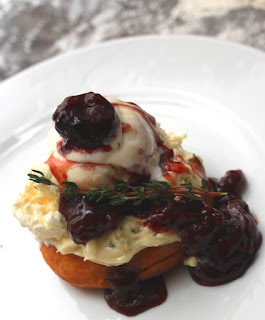 Even if you don't make the donuts and the butter from this recipe...you MUST give the sangria poached cherry compote a whirl! You can find Melissa's dried cherries and the fresh thyme I used today in the produce section of your grocery store. They've got a great variety of products from fresh herbs, to vegetables, to exotic and freaky fruits! Plus, they're pretty cool people, so I don't mind giving them a shout out. Preheat oven to 175 degrees, or lowest possible setting. Place 1/2 cup water in an oven proof bowl and set it on the bottom shelf of the oven to create some humidity. After the oven hits its temperature, turn the oven off. My oven has a bread proofing function, so if yours does, use that setting with the bowl of water and keep the oven on. Sift and whisk together the flours, sugar, salt, and pumpkin pie spice. Set aside. Combine the yeast and milk in a stand mixer fitted with the paddle attachment and mix on low speed for about 3 minutes. Slowly add the dry ingredients, egg, vanilla and butter and mix just until combined. Increase the mixer speed to medium and let the dough work for about 8 minutes, until it pulls completely away from the bowl, and sticks to the paddle. It should come away easily from the paddle, but still be a little sticky. Transfer the dough to a greased, stainless steel bowl, cover it with plastic wrap and allow it to rise in the oven for about 30-45 minutes, until it triples in size. Heat the oil in a dutch oven or deep fryer to about 350 degrees while the dough is rising. Remove the dough from the oven and spread it out onto a floured surface. Roll it out to about 3/4" thick. Cut out 3" rounds with a glass or biscuit cutter and fry in the oil for about 1 minute on each side, or until golden brown. Remove from the oil with a slotted spoon and transfer to a baking sheet or dish lined with a paper towel. Dust with powdered sugar immediately. In a medium saucepan combine the dried cherries, sangria, vanilla bean paste and sugar. Bring to a boil and reduce to a simmer for about 10 minutes, until the cherries are reconstituted, puffy and soft. Whisk in the corn starch and mix until the sauce thickens, another 2-3 minutes. Remove from the heat and set aside until ready to use. Combine all ingredients and stir with a spoon until smooth and combined. Set aside until ready to use. Spoon half of the cherry compote into a food processor and mix for about 10 seconds, until the mixture is smooth. Place it into a pastry bag with a long tip. Make a small cut into the sides of the donuts with a paring knife, insert the pastry bag and fill the donuts with 1-2 tbsp. of the cherry compote. Place each of the filled donuts on a small serving dish. Spoon about 1 tbsp. of the thyme & honey butter on top of the donuts. Place a scoop of ice cream on top of the honey butter. Drizzle some of the remaining cherry compote on top of the ice cream. Garnish with a thyme sprig and serve immediately.